Robertrains wrote: OK, I am well aware that the "ALCOS" are gone! They all, except RS2U #469, were scrapped at the Roundhouse in Saginaw by Waymore® Power in 2011!!!! I was really hoping LSRC SD40 #5921 would be coming down the tracks! WOW, LSRC is getting "BIGGER!!!!" This is awesome!!!! I hope they stay "Independent!!!!" Usually when someone wins, that means someone lost. Pretend you're a CSX employee. Imagine how you would feel about having the choice of moving somewhere else or losing your job. Given the recent growth of Lake States, I expect the wall street vultures will start circling. Enjoy it while you can. I haven't been following the trains in Plymouth for awhile but did all the CSX north/south traffic dry up? I remember a Q train, Grain and a Coal train(I imagine this is gone since everyone is going green these days). If this traffic still exists will CSX still run it or is it going to be handed off in the North yard for Lake State to take? Crow T Robot wrote: I haven't been following the trains in Plymouth for awhile but did all the CSX north/south traffic dry up? I remember a Q train, Grain and a Coal train(I imagine this is gone since everyone is going green these days). If this traffic still exists will CSX still run it or is it going to be handed off in the North yard for Lake State to take? I was wondering this myself!!!! Now, I talked recently to "Railfan Gary" and he said that the current main CSX trains to/from Flint now originate/terminate at Rougemere Yard! They don't do that at Walbridge, Ohio anymore! They turn on the north "Wye" in Plymouth. Now, it sounds like coal and grain still work the line. Those may be the through trains now that still cross the diamond. I wonder if LSRC trains will interchange at Rougemere or Plymouth. I need more "Clarification" on all of this!!!! However, it is very exciting for LSRC and yes I hope the current CSX employees keep their jobs!!!!! CSX RR train and engine crews are currently based out of Walbridge, OH which is south of Toledo, and worked to and from Flint and to and from Rougemere Yard, Daerborn. Grand Rapids operating crews worked to and from Rougemere Yard. The only trains that use Toledo crews that operate to Flint are the grain and coal trains. All of the freight runs out of Rougemere yard in Detroit via D735 and D736. Today, Sunday January 27, 2019, I photographed LSRC GP38M #2052 at the CSX Rougemere Yard (Ferney Street), Dearborn! It's easy to get pix of it sitting there. Looks like it will be "Scrapped" soon and the number boards are gone!!!! Last edited by Robertrains on Sun Jan 27, 2019 8:39 pm, edited 3 times in total. Robertrains wrote: Today, Sunday January 27, 2019, I photographed LSRC GP38M #2052 at the CSX Rougemere Yard (Ferney Street), Dearborn! It's easy to get pix of it sitting there. Can you confirm it is being "Scrapped?" Yes, I talked to one of the guys at the CSX Rougemere Yard office. He said it is going to be "Scrapped!!!!" If you are nice to them, they can help. 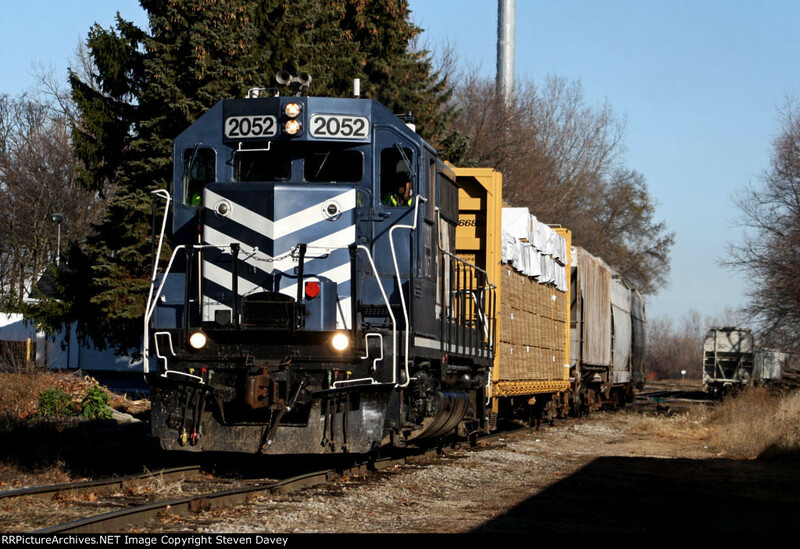 The 2052 was the last unit of the original units assigned to Saginaw in late October 2005. At SBS-LSRCs startup. The other units on day 1 where the 2003, 975, 3504, 281, 1280, and the 381. All the units from day 1 are now gone. The 2003 is still around but silent and a shell of it's former self as slug #304. Wonder whats wrong with it. Hate to see it scrapped if someone could use it. Seems a number of railroads with 4 axle power bought 6 axle for heavier trains that makes me wonder if management might be selling the 4 axles soon. GLC, INER and LSRC all went this route. In Coldwater we had a different 4 axle every weekend cause our 110 steamer is down for its FRA boiler inspection. GP9, GP30, GP10, GP7 all provided by INER as back-up. Made the drive over a guessing game as to which unit would be on the train. I loved the diversity of power as a conductor on each one. It's nice to have a good working relationship with the managment team at Milford Grain. Maybe the new power for lake States me to involve the operation of PTC. SD80MAC wrote: Port Huron is home to 1 or 2 local/yard jobs plus the D711 Flint turn. There has always been locals based in PH but the D job wasn’t based there until they closed Flint as a crew base around 2013. CSX_CO: 10 minutes, keep hoping the yard blows up and I won't have to go in tonight. Unless they have received permission from the FRA to remove the signal system, they must maintain it. I'm not aware that they have filed or will file for that permission. Is there any hope that this deal might bring back some lost customers or new ones? There's not a lot of prospects but LSRC has a good marketing and sales team so whatever is out there I'm sure they'll be knocking on doors. One that comes to mind is the transload yard in Wixom. CSX built and operated it but shut it down. Crow T Robot wrote: Is there any hope that this deal might bring back some lost customers or new ones? LSRC tried shutting off the signals between Mt Morris and Saginaw but the FRA wouldn't approve it. So the Signals will stay lit for a while. Plus Plymouth to Flint see's more Hazmat traffic due to the P.H. connection. So in general terms CSX intends to keep the Port Huron status quo, with LSRC hauling traffic up to Flint. I'm excited to see what the Lake State might be able to do with the Flint area, in terms of regenerating traffic. Whole lotta yard space available, too, for storage cars. I remember as a kid when CSX and CN/GT removed what was left of the interchange, the station siding and anything else associated with it around the diamond in Holly. What would ever warrant them putting any of that back in? Not saying that they would want to, I just find it interesting that the option is there when the interchange at Flint seems like the more logical place to go. Also, what will happen the night before the lease begins? Will CSX run one train through to grab anything that is theirs such as locomotives and leave everything else behind that isn't theirs?